Just give us your feet. Be more beautiful and stylish with our manicure service. All of the staff are well-trained, careful and whole-hearted. Take the time from your busy schedule to help your hands and nails look their best. Indulge your feet with our exclusive spa pedicures. Our pedicure chairs are noiseless and pipe less offering the best combination of relaxation & sanitation. We'll make you feel like royalty! We understand that waxing is personal, so we're committed to making you comfortable, both through friendly, straightforward service and the very best waxing products available. 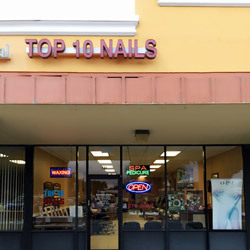 Welcome to Top 10 Nails in Orange Park, Florida, an elegant experience in the deluxe nail salon. We strive to provide a relaxing and fun atmosphere for our clients. We use only the best quality products. All of our technicians are licensed in their field of expertise. We provide free Wi-Fi and satellite TV for your listening and viewing pleasure. We also provide complimentary soft drinks, bottled water, and wine. Come in and get relaxed today! Our philosophy is very simple...to provide comfort and relaxing experiences with quality services while keeping the price reasonable. "We make love to your nails"